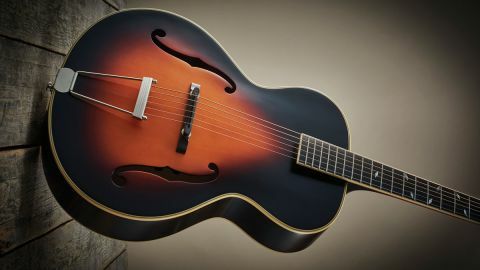 Interesting, cost-effective archtop; investigate if you’re after something different. Tones will be a little harsh for some players. Ah the old question. Is an acoustic guitar that you can truly amplify truly an acoustic, or is it an electric, or even an electro-acoustic? The main selling point with this zenith is that it’s an archtop guitar, rather than a flat-top design. Note the two-piece bridge, the ‘floating’ top end of the neck and of course the two F holes, all of which make it obvious that this is no ordinary strummer. in natural or burst finishes, plus super-solid hardware and details that ooze class. Look more carefully and you’ll even see a certificate peeping out behind the top F hole - so how does it perform when you pick up, plug and play? Rightly or wrongly, in this retro-focused world, it makes sound commercial sense to look backwards when it comes to instrument design. The new Zenith has been designed to resemble the original ancient Epiphone archtops, with a lower bout of 16”, an upper bout of 11.5” and a waist of 9.4”. If these measurements seem meaningless, that’s fine; let’s just say the guitar has a large frame, offset for comfort. according to Epiphone, archtop purists regard these numbers as ideal when it comes to sound and volume, which is good enough for us. Nostalgic the design may be, but the engineering and construction has all the hallmarks of modernity. Made in the Gibson and Epiphone factory in Qingdao, China, the Zenith has an ebony fingerboard - the real thing, rather than an eco-friendly synthetic version, so if real wood is your thing, look no further. Bound with a single layer of ivory binding for a trad look, the neck complements the body, also bound in ivory and black. These components are micromillimetrically tight, as they should be at this midmarket price point. Moving down the five-piece maple and mahogany neck and checking for sharp fret ends (there’s not a finger-slicer in sight), we encounter a dovetailed set neck which feels completely secure - an important consideration given the amply-nourished dimensions of the instrument. The guitar comes with an optional pickguard and hardware to attach it; you may wonder what the shark-fin-shaped thing clattering around inside the box is, until you discover this fact. You may require it to prevent body damage if you’re a hard hitter, but for aesthetic reasons alone we left it off during our review. This is largely because the body top is already crowded enough, with those F holes and that amazing two- piece bridge. The latter, an adjustable unit via two thumbwheels, looks delicate; let’s hope it’s robust enough to survive the trials and tribulations of gigging. The overall impression is of a big guitar, topped off with a solid headstock and balancing well seated or on a strap, with a weight that is not too much to handle and user-friendly dimensions. The details are all in place, with the battery compartment integrated usefully into the input socket; heavy tuners whose stiff operation implies decent quality; and hardware that seems designed with the user’s practical needs in mind. There’s a pickup under the bridge, as well as a preamp - complete with volume and EQ inside the guitar - lurking somewhere, so let’s see how the zenith performs with some voltage up it. Unamplified, the Zenith is loud enough for small (very small) performances, but it really comes into its own when plugged in. This is for several reasons. Firstly, the natural sound isn’t exactly warm: the low end is big enough, for sure, but there’s a combination of mids and top end which conspire to make the sound - to these ears at least - a little hollow and jagged for comfort. Then there’s the floating neck; by its very nature, the gap between the raised end of the bridge, suspended over the body as it is, and the body below, is so high that jazzers and folkies will love the way it allows you to dig it at the neck end. This means that the natural tone is slightly muffled, lacking the crisp edge that you’d get if you dug in down by the bridge - which means in turn that plugging in and rolling on the treble is highly advised. Finally, the neck profile - a full, unapologetic c shape - doesn’t exactly lend itself to fast fretting and barre chord changes, so a lick of extra volume from the preamp will be welcome, because it means you have to work slightly less hard. For all these reasons, the Zenith sounds bigger, better and more professional when plugged in. the tone, with more of the slightly harsh edge we mentioned above. Roll that off a bit and punch the volume, and you’re given a more sociable tone - one that won’t scare the neighbours’ dog but which still has clarity. Whatever Epiphone was striving for when it designed this resolutely historic-looking instrument, they seem to have achieved it. your lap; you need to play it with power and conviction if you’re to maximise the return on your £679. Approach it half-heartedly and it won’t respond as well as it would to a full- motion strum. It’s that kind of guitar; a beast that wants to fight back. If that’s not your cup of tea, that is totally understandable - and there are plenty of excellent alternatives at a similar price who will be happy to roll over and let you tickle their tummies, so to speak. The Zenith may be slightly unusual, but that’s no bad thing in a world of similar-looking guitars. Sure, its tone range is a little odd, but again, it’s an alternative to the usual warm, woody sounds - and its character may suit your requirements perfectly. You won’t know until you give it a try, so seek out an Epiphone dealer (and take a heavy-gauge pick with you). Sometimes what we need is what other musicians don’t - and we’re fortunate that options exist to go outside the norm. This guitar offers you that option.